UDM Downloads > ES iPod Audio Converter! iPod Audio Converter is an easy to use tool to convert audio files to iPod Audio Format and also to another various audio formats,also can extract audio from video files to various audio formats.The program can also rip audio CD tracks to the iPod supported format. The Features: 1) Supported Output Audio Formats: iPod default format,wav,wma,mp3,ogg. 2) Supported Input Audio Formats: cda,wav,wma,mp1,mp2,mp3,mp4,ogg,aac,alac,flac,ac3,spx,mpc,tta, ape,ofr,midi,adx,mod,mo3. 3) Supported Input Video Formats: .wmv,asf,avi,mpg,mp2,mpeg,mp4,mov,dat. 4) Supports Ripping Audio CD Track using fast and direct method for ripping. 5) Easy-to-use design. 6) Support the most popular audio formats. 7) Supports multiple CD-R/RW drives for Ripping. 8) Play back toolbar for listening to files before converting. 9) Automatic generation for track names. 10) Variety range of encoders. 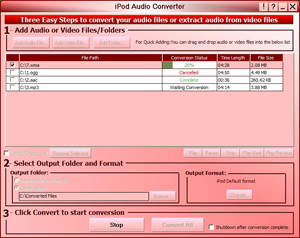 With iPod Audio Converter you can: Add Audio / Video files to convert or extract, or even you can add a whole folder and the program will add the supported files into the conversion list, Watch the conversion list, review (Play) the files to exclude any file you need, Select either to output the files to the same input folder or to any other folder using step 2 and then Start converting the selected files or the whole list. If you select video files for conversion, then the program will extract the audio part to the selected output format. If the output file is already exist, then the program will rename the output file automatically.